It is very colorful and tasty, and the ingredients blend well. This salad presents itself well and has great flavor. This beautiful, delicious salad lends itself to variety - you can serve with main dishes or a low-carb crackers of different shapes. The salad is substantial and filling and always a hit with family members and friends. They will love this delicious and invigorating salad. This is also a good way to get your greens. The recipe is easy and quick and makes for a nutritious salad. The feta gives it a beautiful and delightful texture and the combination of tastes is just perfect. Boil the eggs, peel them and quarter lengthwise. Deseed the pears and cut into thin slices. Toss the baby spinach into a bowl. Season with olive oil. Top with eggs, feta and pear and serve. 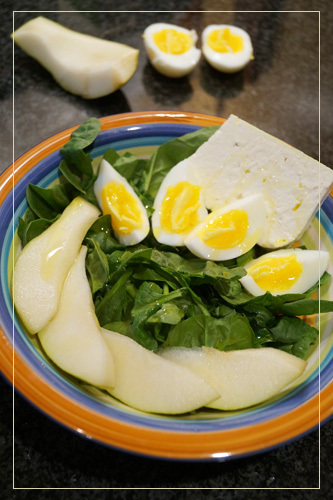 The sweetness of the pear and the sourness of the feta cheese give this salad a unique taste.